Outbound B2B Telemarketing Companies UK | B2B Lead Generation Services - Amvoc Ltd.
Is telemarketing still an effective lead generation tool in the current world of digital and social marketing? Telemarketing, according to two major independent surveys conducted in 2017, is one of the top three marketing channels used to generate quality and quantity of new business leads. 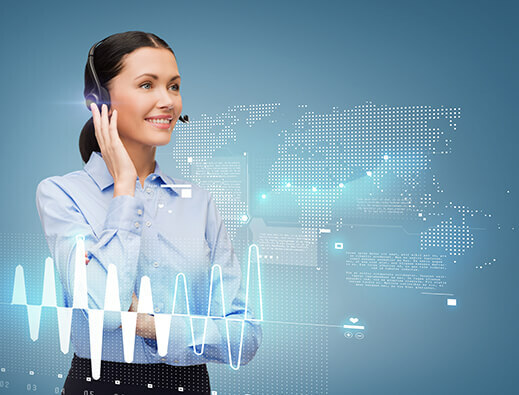 Even with digital and social marketing channels becoming increasingly popular, telemarketing still remains supremely effective when it comes to B2B lead generation for the longer term sale. Of course, in order to optimise B2B lead generation ROI, companies need to understand the short and long term sales processes involved in telemarketing. Businesses that are involved in a long term sales process have a much more complex lead education and nurturing process than those with a shorter sales process. B2B sales with a complex strategy require a sophisticated and precise campaign in order produce the desired results whether this is a sale or a face-to face appointment. A reliable, investment worthy telemarketing campaign needs synergy in order to continuously adapt and perfect a sales programme and complement existing marketing methods so that the sales pipeline is viable and bringing in revenue. An organisation can never have too many new business opportunities but understanding how to capitalise and cash in on these opportunities is as important as securing the prospects in the first place. B2B Telemarketing Services will boost your new business lead generation and potentially send your sales to levels you have never seen before. B2B Telemarketing, however, is not for everyone. For some campaigns consistently calling an average of 170 to 180 new prospects per day is the only way to achieve success with telemarketing. Do you have the time and the determination to make this happen? Other more sophisticated and niche market projects only require 20 to 30 new prospect calls per day. Knowing what is required and when is just as important as the script, person calling and number of calls. Have you considered the huge costs involved in setting up a proactive telemarketing team in-house? Outsourcing to a team of sales orientated and experienced telemarketing experts is your best option. Integrating a campaign is extremely important – you may have the leads but struggle to make the sales or you may have the client base but little room for growth. If you do not have a proactive marketing strategy in place, Amvoc’s lead generation services can help you to get your new business acquisition/retention in shape by producing a tailor made and integrated multi-channel campaign. An experienced and reputable Business to Business telemarketing company will drive new business into your company, enhance your reputation and build confidence throughout your organisation. Amvoc will focus on achieving the highest quality leads for you whilst maximizing your conversion rates. We are genuinely interested in ensuring that you only receive the highest quality new business sales lead/s – we will not compromise on quality. Amvoc will make your B2B Telemarketing campaign simple to commission and easy to understand. We pride ourselves on producing successful results consistently.